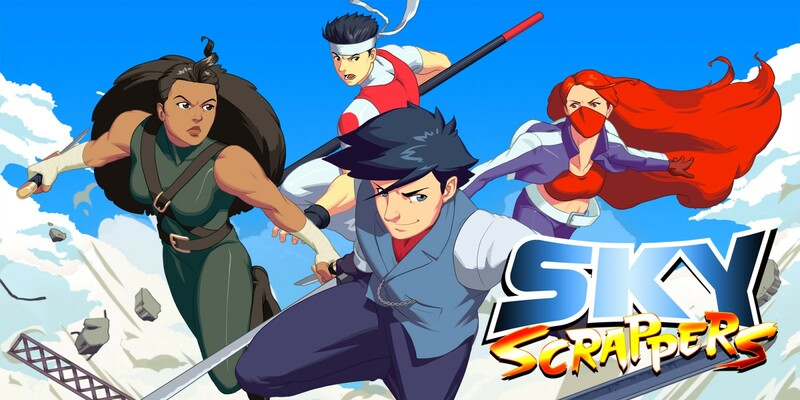 In a world where arcade-styled 2D side-scrolling fighting games are a dime a dozen, there is also the occasional vertical scrolling fighting game and one such title is SkyScrappers by Ground Shatter. Previously released on the likes of Steam and PlayStation 4 back in 2015, with Ant Workshop acting as its publisher, SkyScrappers is making its Switch debut this October, but it won’t necessarily be welcomed to the chorus of joyful cries that both its developer and publisher hope the game would be greeted by. Having already been met with mixed reviews three years ago, for the most part, SkyScrappers is still very much so the platform brawler game it once was. It does have one new feature that does offer a new way for players to experience the game, but other than the new feature, it’s still just the 60 FPS local multiplayer title it always was, which has four different characters and a single player story mode that consists of 7 stages. Anyhow, since there is a new feature, let’s give it the time and attention it deserves. With more and more arcade games on Switch, typically the vertical-scrolling shooter ones, the Switch version of SkyScrappers actually supports Tate mode. What this means is instead of holding the Nintendo Switch horizontally in their hands, players can actually hold it vertically and the game itself will be flipped, thus fitting the new screen parameters. But what of the actual gameplay and the gameplay behind, well, SkyScrappers is a game about 4 characters. Characters who come in the form of Phileas from London, Solene form Paris, Jessica from Dallas and Kichirou from Tokyo. Each has their own motivations for entering the global competition and provided you haven’t disabled them, will have unique dialogue with the opposing fighters before the start of each battle. Whoever reaches the top, is the victor, but for the players who struggle to time their jumps just right to reach the descending platforms and avoiding the fiery objects that will cause damage, you can always result to hitting your opponents with the B button. With each character having a life bar, if you can’t jump, as long as you can punch, empty your opponent’s life bar and be the last one standing, you will win the round. When playing through the main game, the number of rounds a player will need to win to be victorious, can depend on which stage in the single player campaign they are on. In the earlier ones, you are only required to win two rounds, whereas the final battle requires you to win four rounds and you will have to win that number of rounds as it is not a “best of four” battle, but a “first to four round wins” kind of battle. In multiplayer though, you can set the number of rounds you wish to play from those available, and set how high the building you need to traverse is. Aside from just jumping and striking, players can prompt ground pounds and administer special skills, but in the event they fail to keep up with a player who are soaring to new horizons, although they will be given a boost, they will lose some health and have their special bar drained somewhat. So as tempting as it is to stand around punching objects at one another, if one person is leaping platform to platform, you all need to be moving. As for the general art style and soundtrack, there’s not much in particular to write home about if I’m honest. SkyScrappers has a very 90’s feel about and while the overall packaging isn’t all that bad, it doesn’t quite stand out either. SkyScrappers looks and acts like your typical 90’s game and although that’s not always a bad thing, in SkyScrappers case, the game just winds up looking bland, due it’s vastly minimal content and near lack of replay value. Despite showing some promise, SkyScrappers is simply not the game it could have been. It’s nice to be able to have it on Switch, especially at a cheaper price than it is on Steam and have a supported Tate mode, but it would have benefited more if it had just a bit more content so as to mix things up, as opposed to looking and acting like a one trick pony, which had three years to learn a new trick, only to have that new demonstration wind up being a shallow means of misdirection, meant to fool you into thinking you get bite for your buck, when that is simply not the case.